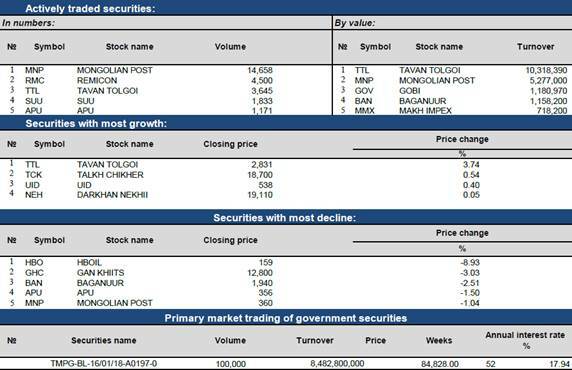 January 24 (AAStocks) MONGOL MINING (00975.HK) announced that holders of supporting notes with the aggregate principal amount of the notes of additional US$11.16 million submitted their signature pages to accede to the noteholder. As a result, holders of supporting notes which in aggregate constitute approximately 96.06% of the principal amount of the notes had entered into the noteholder RSA (restructuring supporting agreement). January 25 -- TerraCom Limited (TerraCom or the Company) (ASX: TER) is pleased to provide a further update on positive progress made across on a number of critical business activities in Mongolia. As previously announced, recommissioning of BNU Coal Mine in Mongolia is complete and the mine is in full production. The Company is pleased to announce that coal is flowing from the mine ahead of schedule, in preparation to supply product for the recently executed offtake agreement for sales of hard coking coal (HCC) to the Kingho Group. Coal production was achieved on 22nd January, 10 days ahead of schedule, whilst continuing the strong injury free record at the mine. The Company is also pleased to announce that as part of the recently executed Kingho Group offtake agreement for sales of hard coking coal (HCC) produced from the BNU Coal Mine, that the first 100% USD Irrevocable Letter of Credit (LC) has been received for sales of January / February 2017 production tonnes from the mine. The LC has been issued by Agricultural Bank of China, and receipt has been confirmed by the TerraCom Mongolian banking counterpart. The tonnage and pricing were agreed by Kingho and the Company at the start of the month in line with the terms of the agreement, with the price linked to a commercially in confidence minegate pricing structure that reflects the seaborne market. January 24 (Bank of Mongolia) Spot trade: Commercial banks bid weighted average rate of MNT2473.64 for USD6.7 million, asked weighted average rate of MNT2487.31 for USD18.4 million and weighted average rate of MNT355.31 for CNY47.0 million respectively. the BoM did not accept any bid offers. Swap and forward trade: The BoM received buying bid offers of USD1.0 million of MNT swap agreements and selling bid offers of USD20.0 million of USD swap agreements from commercial banks and the BoM accept the selling bid offers of USD20.0 million. 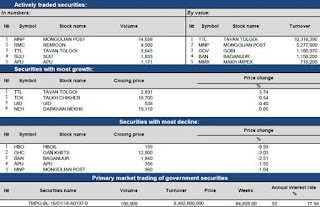 January 24 (Bank of Mongolia) Statistics of some accounts revised starting from January 2008, based on the detailed reports with sectorial classification received from banks, prepared as a result of the update of accounting batch materials. Foreign currency deposits of commercial banks at the central bank included in reserve money starting from December 2008. Please refer to Table 1 for revision of consolidated balance sheets of banks and Table 2 for revision of monthly statistical bulletin. SYDNEY, Jan 24 (Reuters) - Copper crept higher on Tuesday as the dollar struggled amid concerns of U.S. protectionism under the newly-formed administration of President Donald Trump. Three-month copper on the London Metal Exchange was up by 0.5 percent to $5,826.00 a tonne by 0700 GMT. The most-traded copper contract on the Shanghai Futures Exchange was also 0.6 percent firmer at 47,070 yuan ($6,863) a tonne. Trump formally withdrew the United States from the Trans-Pacific Partnership on Monday, saying he would seek one-on-one trade deals with countries that would allow Washington to quickly terminate them "if somebody misbehaves". The dollar wallowed near seven-week lows in Asian trade, pressured by concerns about the impact of U.S President Donald Trump's protectionist trade stance. Trump's nominee for Treasury Secretary Steven Mnuchin was quoted by Bloomberg as saying that an excessively strong dollar was negative in the short term, which put additional pressure on the currency. A weaker dollar makes dollar-denominated assets such as copper cheaper for holders of other currencies. Copper, widely used in construction, has rallied 14 percent since Trump won the U.S. election on Nov. 8 on the back of promises to cut taxes and boost infrastructure spending. Caroline Bain, chief commodities economist for Capital Economics, said she did not expect a major increase in U.S. manufacturing output. "However, this may change if U.S. trade policy becomes more protectionist or there is sizeable investment in infrastructure in the first year of Donald Trump's presidency," Bain said in a note. Offsetting expectations of rising copper prices is the Lunar New Year holiday, starting Jan. 27, which is expected to subdue metals demand this month as Chinese factories close, sometimes for two to three weeks. LME zinc was steady at $2,790 a tonne, maintaining its standing as one January's best performing metals. SHFE zinc rose 0.3 percent 22,695 yuan tonne. LME aluminium returned some overnight gains to trade slightly down at $1,845 a tonne. On Monday, the metal climbed as high as $1,873, the highest since May 2015. ShFE aluminium added 0.18 percent to 13,725 yuan a tonne. Jan 24 (Reuters) If you wanted to see what a speculative commodity bubble looks like, then coking coal's huge rally in the second half of last year and subsequent retreat provides a good example. Like most bubbles, coking coal's surge had a solid foundation in supply and demand fundamentals, with top buyer China's appetite for the fuel used to make steel rising sharply in 2016, and suppliers unable to respond rapidly. Coking coal futures on the Singapore Commodity Exchange leapt from $86.92 a tonne on June 1 last year to a high of $299.87 on Nov. 30, a gain of 245 percent. They have since dropped by almost 40 percent to Monday's close of $184.17 a tonne, still more than double what they were in the middle of last year, but also probably a level more reflective of market dynamics. Chinese coking coal futures on the Dalian Commodity Exchange have dropped from a peak of 1,676 yuan ($244.39) a tonne on Nov. 14 to close at 1,180 yuan on Monday, a decline of almost 28 percent. There is little doubt that the huge rally in coking coal was off the back of Chinese demand, with customs data showing that the country imported 59.23 million tonnes in 2016, a jump of 23.8 percent from the prior year. This was partly because steel output was higher than expected because domestic coking coal production was crimped by government policies that lowered the number of working days at mines. But delve deeper into the Chinese customs data and it seems that the rise in coking coal imports by itself doesn't really justify the sharp rally in prices in the second half of the year. The SGX futures contract is based on the Steel Index free-on-board Australia coking coal price, and is thus reflective of the cost of the fuel at ports in Australia, the largest exporter of the fuel. The almost fourfold increase in prices in the five months from June to November last year wasn't accompanied by a huge surge in China's imports from Australia. China's total coking coal imports from Australia in 2016 were 26.77 million tonnes, an increase of just 4.8 percent. In the seven months from June to December, China's imports of Australian coking coal were down from the year earlier months in four, namely June, July, November and December. The three months in which they were rising, August, September and October, were also the months in which prices were surging, providing some fundamental basis for an increase in prices. But overall, the tightness in the coking coal market appears to have been wildly exaggerated by the huge rally, with the relatively modest increase in demand for Australian cargoes standing in sharp contrast to the jump in prices. So where was China actually getting its extra coking coal from? The answer is neighbouring Mongolia. Chinese imports from Mongolia jumped 85.2 percent in 2016 to 23.56 million tonnes, putting it just behind Australia among suppliers to China. 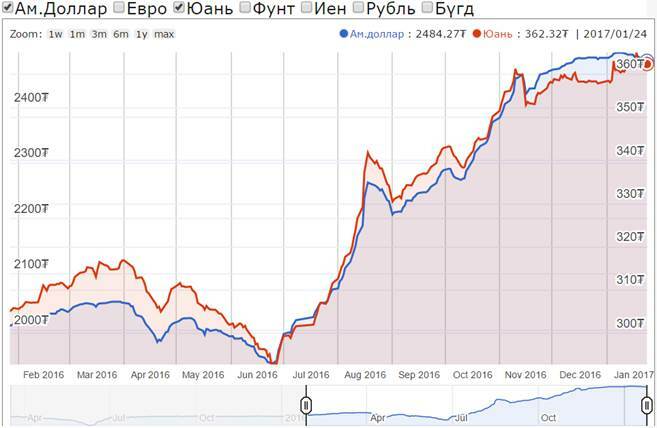 It's not surprising that Mongolian coking coal is gaining on Australian supplies, given it is massively cheaper, with customs data showing it cost China $62.93 a tonne in December, while cargoes from Australia were $233.72. Another factor to consider is Chinese imports of North Korean coal. This is classified as anthracite by customs, but North Korean supplies are largely used as coking coal in steel-making or as a high-quality fuel in other manufacturing, such as ceramics. China imported 22.42 million tonnes of anthracite from North Korea in 2016, an increase of 14.6 percent from the prior year. This was achieved despite Beijing saying it would place sanctions on imports from its neighbour in line with UN resolutions against Pyongyang's nuclear weapons programme. Among other suppliers of coking coal to China, imports from Canada, its third-largest provider, dropped 9.3 percent in 2016, while those from fourth-ranked Russia slipped 19.4 percent. The United States, which used to supply coking coal to China, didn't export to China at all in 2016, according to the customs data. With the froth having come out of coking coal prices, the question becomes what will happen in 2017? There are some likely trends in China that will shape the market. Chinese coal mines are currently maximising output to take advantage of the still healthy price, but may face production restrictions later in the year as Beijing has made it clear it is still determined to cut excess capacity by closing older and less efficient mines. Supply is likely to increase from Australia and elsewhere as miners bring back idled output or work existing mines harder. 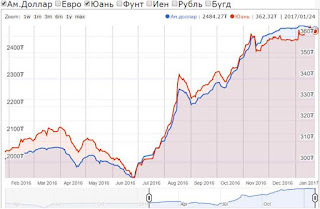 Imports from Mongolia are likely to remain robust, given the massive price advantage, while those from North Korea are less certain, given Beijing's commitment to limit imports to an annual 7.5 million tonnes, about a third of the 2016 level. If China does stick to this limit, it will certainly provide support for seaborne coking coal exporters, as Chinese buyers will have to seek alternatives, and it will be easier to import via ship than use trucks and rail cars from Mongolia. China's purchases from North Korea thus remain the main x-factor for seaborne coking coal markets. MANILA, Jan 24 (Reuters) Chinese steel and iron ore futures rallied on Tuesday as investors chased prices higher after a four-day retreat, betting demand will pick up following the Lunar New Year break as Beijing moves to spur economic activity. Traders and end-users are likely to replenish steel inventories from next month on hopes the government will lift infrastructure spending. But trading activity in physical markets was extremely slow ahead of the week-long holiday that starts on Friday. The most-active rebar on the Shanghai Futures Exchange was up 4.1 percent at 3,304 yuan ($482) a tonne by 0317 GMT. It earlier climbed as high as 3,344 yuan. Iron ore on the Dalian Commodity Exchange was up 6.1 percent at 648 yuan per tonne, after climbing more than 7 percent at one stage. "Investors are probably building positions in belief that prices may go up after the holiday which will be supported by restocking," said Richard Lu, analyst at CRU consultancy in Beijing. After easing credit lines to boost the real estate sector last year, China may focus on infrastructure investment this year and take measures to keep the economy growing at a stable clip, said Lu. China's economy grew a faster-than-expected 6.8 percent in the fourth quarter of last year on higher government spending and record bank lending. But growth in all of 2016 stood at 6.7 percent, still the slowest pace in 26 years. Ahead of China's Spring Festival, trading was tepid in physical markets for both steel and iron ore, and traders say activity is unlikely to gain steam until after early February. "We can barely hear offers and bids in the physical market right now, they're very scarce," said Lu, adding that steel export markets were similarly hushed with some Asian markets also shutting off for the Lunar New Year. Iron ore for delivery to China's Qingdao port .IO62-CNO=MB rose 0.9 percent to $81.13 a tonne on Monday, after a two-day drop, according to Metal Bulletin. Stocks of imported iron ore at China's ports reached 119.1 million tonnes on Jan. 20, the highest since at least 2004, according to data tracked by SteelHome. January 24 (Reuters) Gold slipped from a two-month peak on Tuesday as investors took stock of U.S. President Donald Trump's first policy moves and the dollar stabilised after plumbing seven-week lows this week. Trump formally withdrew from the Trans-Pacific Partnership trade deal on Monday and told U.S. manufacturing executives he would impose a hefty border tax on firms that import products after moving American factories overseas. "It's all been flagged and it's all playing out according to the well-rehearsed script of Trump and his advisers," Robin Bhar, Societe Generale's head of metals research, said. "The high in gold is an opportunity to take a bit of profit," Bhar said, adding that the price was stuck in a $1,120-$1,220 range. Trump's protectionist statements and a lack of detail on policy have led some investors to opt for gold, which is often seen as an alternative investment in times of geopolitical and financial turmoil. It rose to its highest level since Nov. 22 during Tuesday's session before giving back gains. Spot gold was down 0.3 percent at $1,214.53 an ounce after peaking at $1,219.59. U.S. gold futures slipped 0.2 percent to $1,213. The dollar index, which measures the greenback against a basket of currencies, hovered near 100.070 after falling to a seven-week low of 99.899 in the previous session. Analysts said the gold market was seeking clarity from Trump's administration on tax and spending policies that could impact growth and provide clues on the direction of U.S. interest rates. "The focus is going to be about what Trump and his team are going to do in terms of cutting corporation tax and incentivizing U.S. companies to bring back profits held overseas," ICBC Standard Bank analyst Tom Kendall said. "It's those kinds of fiscal policies that will be important for gold." Volumes and buying demand on the Shanghai Gold Exchange are expected to start drying up between now and the week-long Lunar New Year break, MKS PAMP Group trader Alex Thorndike said. Silver lost 0.3 percent to $17.13 per ounce, while platinum gained 0.6 percent to $982.7. Palladium was up 0.4 percent at $781 an ounce after hitting $795.60, its highest since May 2015, in the previous session. January 24 (Reuters) Oil prices climbed higher on Tuesday ahead of weekly U.S. inventory data on evidence the global market is tightening as lower production by OPEC and other exporters drains stocks. Increased drilling in the United States, however, could keep a lid on prices. Brent LCOc1 futures were up 37 cents, or 0.7 percent at $55.60 a barrel by 11:26 a.m EST (1626 GMT), while U.S. West Texas Intermediate CLc1 rose 53 cents, or 1 percent, to $53.28 per barrel. That put WTI on track for a fourth daily increase in a row, its longest winning streak since the end of December. Ministers from the Organization of the Petroleum Exporting Countries (OPEC) and big producers outside the group said on Sunday that of the almost 1.8 million barrels per day (bpd) they had agreed to remove from the market starting on Jan. 1, 1.5 million bpd had already been cut. "The petroleum markets are bobbing back to the upside on light volume, with the January production cuts from OPEC and cooperating non-OPEC producers as the primary support," Tim Evans, Citi Futures' energy futures specialist, said in a note. However, the reduction in supply by OPEC is being offset by an increase in U.S. production as prices rise. U.S. drillers added the most rigs in nearly four years, data from energy services company Baker Hughes showed on Friday, extending an eight-month drilling recovery. "OPEC is gradually coming to the realization that they may have received more than they bargained for in re-activating U.S. drilling activity," Jim Ritterbusch, president of Chicago-based energy advisory firm Ritterbusch & Associates, said in a note. U.S. oil production has risen by more than 6 percent since mid-2016, though it remains 7 percent below the 2015 peak. It is back to levels reached in late 2014, when strong U.S. crude output contributed to a crash in oil prices. Analysts estimated U.S. crude stocks increased by about 2.7 million barrels in the week to Jan. 20. The American Petroleum Institute (API) is scheduled to release data at 4:30 p.m. EST, while the Energy Information Administration (EIA) report is due at 10:30 a.m. EST on Wednesday. The push by Republicans in the U.S. House of Representatives for a shift to border-adjusted corporate tax (BTA) could push WTI prices higher than Brent, triggering large-scale domestic production, according to analysts at Goldman Sachs. "We expect WTI could move to a $10 per barrel premium to Brent from a $3 discount - a $13 (+25 percent) relative move immediately." Brent's premium to WTI CL-LCO1=R narrowed on Tuesday by about 20 cents to $2.26 per barrel. The appreciation in WTI could be an incentive for producers to sharply increase output, the bank said, warning that the ramp up in U.S. production in a market only starting to rebalance would create a renewed large oil surplus in 2018, which could lead to an immediate sharp decline in global oil prices. Bernstein Energy said global oil inventories declined 24 million barrels to 5.7 billion barrels in the fourth quarter of last year from the previous quarter. This amounts to about 60 days of world oil consumption. "This is the biggest quarterly decline since the fourth quarter of 2013, confirming that inventory builds are now reversing as the market shifts from oversupply to undersupply," Bernstein analysts said in a note to clients. January 24 (Cover Mongolia) Working Group appointed by the State Great Khural introduced the results of their investigation on Tuesday into the acquisition of Russia's 49% stake in Erdenet Mining Corporation by Mongolian Copper Corporation. More on this in next issue. January 24 (news.mn) The Mongolian Presidential Election will be held on 26th of June, 2017. According to Mongolian law, the election date must be announced 150 days before polling. On 24th of January, the Standing Committee on government affairs backed the draft law on the presidential election. The draft law will next be discussed in parliament. A total of 1,234,692 voters participated in the 2013 presidential election. In other words - over a third of all Mongolians. President Ts.Elbegdorj from the Democratic Party received 620,123 votes, B.Bat-Erdene from the Mongolian People's Party won 512,209 votes and N.Udval from the Mongolian People's Revolutionary Party won 80,398 votes. Ulaanbaatar, January 24 (MONTSAME) On January 23-25, National Emergency Management Agency is holding a strategic assembly among its managerial staff to evaluate the effects and implementation rate of the organization's activities of last year and determine the action plan for this year. The strategic assembly gathers about 70 managerial personnel from its headquarter and provincial units. The opening ceremony of the assembly was addressed by Deputy Prime Minister U.Khurelsukh who emphasized on the increasing capabilities of the agency on disaster risk prevention and disaster management. The Deputy Prime Minister also mentioned that a bill on Law of Mongolia on Disaster Protection is under discussion, and that disaster protection system of Mongolia will be improved by adopting the revised bill. With adoption of package of defense laws in 2016, National Emergency Management Agency is now a part of Mongolian army. The agency is obligated to follow the general regulations and manuals of army personnel with the legal status, economic and social protections of the agency's staff becoming clearer in compliance with the newly adopted laws. Following a Cabinet resolution, the organizational structure of the Emergency Management Agency has been updated to a zoned division which will help efficiently utilize the regional operations of the agency. In 2016, 4373 emergency cases and accidents occurred on national level, and the staff of National Emergency Management Agency saved the lives of 1315 people and property worth MNT 23.6 billion. Mongolian emergency workers were summoned to 626 search-rescue missions and 102 traffic accidents, and in total 702 emergency calls. In 2016, 1608 people received first aid from emergency workers. Ulaanbaatar, January 24 (MONTSAME) "The science community of Mongolia is highly grateful to the current Government for its change of attitude towards science", said G.Chuluunbaatar, Deputy President of Mongolian Academy of Sciences today, January 24 at a symposium held in the building of Mongolian Information Technology Park. Intended to discuss the implementation of science-related laws and legislations of Mongolia, current state of and challenges in science sphere, state policy on science and improvement of legal environment, the symposium was organized by Parliamentary Standing committee on Social Policy, Education, Culture and Science, Ministry of Education, Culture, Science and Sports, Mongolian Academy of Sciences and Science and Technology Fund. The Parliamentary Standing committee on Social Policy, Education, Culture and Science has recently formed two working groups concerning science field which have been holding various meetings and symposiums among the scientists and scholars for about a month. "There are two working groups focusing on different areas - innovation and science and technology which have been very active for the last month. Today's symposium is about the fifth such meeting to take place between scientists and the working groups", said D.Regdel, President of the Academy of Sciences. "Based on the outcome of these discussions, the Government is expected to make policy changes and take relevant measures, and we at the Academy of Sciences will be ready to actively contribute to the causes", he added. The symposium was participated by scholars and scientists of all fields and Members of Parliament who are leading the working groups. On the sidelines of the symposium, a scientific exhibition was also held at the Information Technology Park unveiling 93 different types of products. The exhibition is aimed to display the outcome of Mongolian scientists' hard work including the new technologies, substances, drugs, innovative technologies and research products. Ulaanbaatar, Mongolia, January 24 (Oyu Tolgoi LLC) Oyu Tolgoi today announced an update on its production for the fourth quarter of 2016 and, released the latest edition of its Performance Scorecard. Oyu Tolgoi performed better than target on safety in 2016, and continuing to be one of the leading safety performers across Rio Tinto and peers in the broader mining industry. Armando Torres, Managing Director – Oyu Tolgoi, said, "The Oyu Tolgoi team delivered a strong performance over 2016 despite significant operational and market challenges. Our safety performance continues to be one of the best in Rio Tinto – and indeed, across our global mining peers, achieving an All Injury Frequency Rate of 0.22 for the year. Oyu Tolgoi also achieved record setting performance in the open pit operation, and underground development continues to progress well – establishing a strong foundation for the year ahead." Oyu Tolgoi's open pit mining and concentrator operations in 2016 achieved record levels for material mined and ore treated, and exceeded both copper and gold production guidance for the year. Concentrator performance during the fourth quarter was strong with the highest throughput since production began. During Q4'16, progress continued in key areas of underground development with the national workforce working on the underground project crossing 2,000 personnel; Shafts 2 and 5 related activities and construction of critical on-site facilities continued, and the bulk excavation component for the conveyor-to-surface work stream was completed. Lateral development rates are progressing well with a further increase expected in 2017, when additional underground crushing capacity is added. Oyu Tolgoi is expected to produce 130,000 to 160,000 tonnes of copper in concentrates and 100,000 to 140,000 ounces of gold in concentrates for 2017. Oyu Tolgoi's total in-country spend since 2010 crossed US$6.1 billion at the end of Q4 – demonstrating a strong, continuing commitment to local content in both operations and underground development, including US$760 million total spend in country in 2016. The company continued its world-class environment performance, achieving an annual average water recycling rate of 86.2 per cent, and using only 0.423 cubic metres of water per tonne of ore processed – one-third the usage of comparable operations worldwide. At the end of 2016, 93.5 per cent of Oyu Tolgoi's total workforce was Mongolian, including 96 per cent Mongolian employees at the open pit mining and concentrator operations; and with South Gobi residents comprising 22 per cent of the total workforce. Oyu Tolgoi continued its strong contribution to the South Gobi community in 2016 achieving procurement spends of US$69 million, and investing US$9.7 million in sustainable development and community infrastructure projects in the region. Two major infrastructure projects saw significant progress in the last quarter, with the Bayan-Ovoo Primary Health Care Center, a two-story building with 10 beds, a surgery and birthing room, and employing 18 staff, including doctors and nurses completed, and the Khanbogd bulk water treatment plant nearing commissioning. Ulaanbaatar, January 24 (MONTSAME) By the end of 2016, mining licensed area occupies 0.9 per cent of the total territory of Mongolia with 1558 valid mining licenses. In addition, exploration licensed area makes up 7.7 per cent of the territory with its number of licenses of 2022. There is tendency that exploration area has been shrinking year by year. For example, exploration was conducted covering 31.3 per cent of the territory in 2008. However a proposal is being forwarded on increasing the occupancy of exploration area to 20 per cent. Dornogobi aimag has 294, the largest number of exploration licenses. This province has several fields, where product sharing agreements of oil have been made. Government of Mongolia established a product sharing agreement with "Smart Oil Investment of China" company at 'Ergel-12' field of Dornogobi aimag in 2016. The company agreed to conduct exploration work with investment of USD35 million in next 6 years. 'Petrochina Daqin Tamsag" company conducts oil extraction at two fields in Dornod aimag and 'Dongsheng Oil Mongolia' company at one field. A company, which actively looking for investors abroad is 'Petromatad' Ltd registered on London stock exchange and the license holder at oil fields 4,5 and 20. 32.8 per cent of its mining licenses are for gold, 18.7 per cent for coal and 10.6 per cent for spar. January 24 (gogo.mn) Foreign experts recognized Mongolia as a solar energy paradise as country enjoys over 250 sunny days each year. However the country produces only 2-3% of its energy needs from renewable resources. There are many reasons behind such as economic dependency on mining and other economic situation. Renewable energy has benefits to reduce carbon dioxide emission in the atmosphere that causes global warming. Thus, more than 150 countries around the world has united the renewable energy policy. "Mongolia has set a goal to produce 30% of its energy needs from renewable resources by 2030", said by Minister of Energy P.Gankhuu at 7th summit of International Renewable Energy Agency that took place in Abu Dhabi, United Arab Emirates. Moreover he added, Mongolia`s first 50 MW wind farm has started its operations in 2013 with private investment and the first 100 MW solar power plant has commenced its operation in Jan, 2017. Mongolia's severe winter weather condition pushes the majority of households and offices to rely on coal-fired power plants. We urgently need to solve this issue, replacing them with renewable energy sources. We would like to cooperate with IRENA, Abu Dhabi Fund for Developlment and other countries on using solar, geothermal heat pumps and other renewable energy sources as urban heat supply". At the summit, Minister of Energy P.Gankhuu received private sector representatives interested in investing in Mongolian renewable energy sector. Jean-Pascal Pham-Ba, Secretary General and Spokesperson at Terrawatt Initiative has offered to construct solar power plant in Mongolia and supply energy for less than 10 US cents. January 24 (MONTSAME) Buildings with non-flammable, waterproof and fiber-alike sound and heat resistant 'magical' walls have become ubiquitous in Ulaanbaatar, the capital of Mongolia. It's because Mongolians have been extracting stone wool from basalt stones comprised of magmatic crusts of a volcano and manufacturing building materials from it. After studying from the experiences of Denmark, Russia, China and other European countries, Mongolian engineer L.Ariunbold has started stone wool manufacturing project in Mongolia by founding the "Mongol Basalt" Company in 2005. By introducing the energy-saving and heat-loss preventing stone wool to consumers, "Mongol Basalt" is trying to reduce global warming by reducing the emission of carbon dioxide in the air, giving significant contribution to curb the air pollution in Ulaanbaatar. 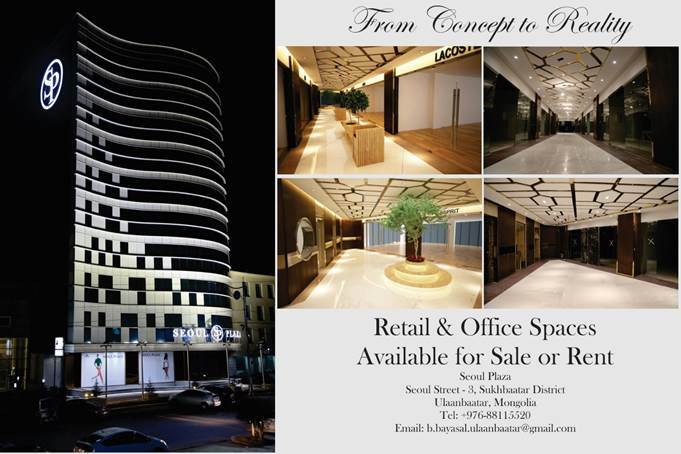 To do this, the company has started working on various major construction and investment projects. For instance, the company has collaborated with the "Jenko Tour Bureau" on the construction of Chingis Khaan Equestrian Statue, using their first sample for the interior lining of the monument. Also, the company has participated in the latest major construction works in the capital, such as, "Ulaanbaatar Department Store", "Shangri La", "Ramada" hotel, "Jiguur Grand" buildings and the new international airport, demonstrating the quality of its product. Ulaanbaatar, January 24 (MONTSAME) Union of health information technology was established, combining 21 entities engaged in health information technology. Today, the heading council of the union held its first meeting and discussed its structure and activities. Main goal of the union is to broaden and develop information technology application and make health information and services electron based.
" – Our union will work to develop health sector with information technology and make contribution to ease physicians' work and give quality health services to more people. We hope more organizations and institutions will join the union" said director of 'Acsis systems' LLC and chairman of the heading council J.Mungunsukh. MITAM also intends to establish unified health e-data system of Mongolians. "- Private sector solely cannot create the e-data system. Therefore, we will collaborate with government organizations and are aiming to accomplish it by 2020. The data system will allow physicians easy access to all information on the patient with his/her permission. Electronic data saves time and it is cost effective. Moreover, it allows being evidence-based. Evidence-based medicine is an approach to medical practice intended to optimize decision-making by emphasizing the use of evidence from well-designed and conducted research" said BoD head of Onom Foundation and executive director of MITAM. January 24 (MONTSAME) U.S. National Institutes of Health's National Library of Medicine (NIH/NLM) published a joint research by Simon Fraser University, Health Sciences University of Mongolia, National Agency for Meteorology and Environmental Monitoring, and World Health Organization on Mongolian air pollution and its attributable mortality of 2011. It's conservatively estimated that 29% of cardiopulmonary deaths and 40% of lung cancer deaths in the city are attributable to outdoor air pollution. These deaths correspond to nearly 10% of the city's total mortality, with estimates ranging to more than 13% of mortality under less conservative model assumptions. There is evidence that fine particulate matter generated by combustion may be especially damaging to human health (Pope and Dockery 2006; Schlesinger et al. 2006). Estimates of the annual global mortality attributable to outdoor air pollution range from 0.8 million to over 4 million, with the majority of attributable deaths occurring in Asia (Cohen et al. 2005; Anenberg et al. 2010). Mongolia's population has undergone rapid urbanization since the mid-1990s, and this shift has had a major impact on the capital city, Ulaanbaatar, which is now home to 1.11 million of the nation's 2.74 million inhabitants (National Statistical Office 2010). Population growth has led to major increases in the city's air pollution emissions (Asian Development Bank 2006; Guttikunda 2007). Much of the population growth has been in the city's low-income ger (traditional Mongolian dwelling) areas where coal and wood are burned for heat (World Bank 2004). Half of Ulaanbaatar's population lives in a ger (Asian Development Bank 2006), and the city's 160,000 gers each burn an average of 5t of coal and 3m3 of wood per year (Guttikunda 2007). Mobile sources also contribute to air pollution in Ulaanbaatar. From 1995 to 2005, the number of vehicles in Ulaanbaatar increased from 30,000 to 75,000 (Asian Development Bank 2006), and Mongolia is 1 of only 17 countries where leaded gasoline is still legally available (HEI 2010). The city's other major air pollution sources include three coal-fueled combined heat and power plants, approximately 400 heat-only boilers, and wind-blown dust (World Bank 2004; Davy et al.2011). A recent source apportionment study found that the majority of PM2.5 in Ulaanbaatar is produced by coal combustion (Davy et al. 2011). Ulaanbaatar is located in a valley with mountains to the north and south (Asian Development Bank 2006; Davy et al. 2011). The topography, extensive pollution emissions, and frequent temperature inversions combine to cause very high pollution concentrations in the winter months. Based on 2009 mortality statistics, we conservatively estimated that 623 deaths in Ulaanbaatar were attributable to air pollution. This represents 9.7% of the 6,426 total deaths in the city and, notably, 4.0% of the 15,522 annual deaths for the entire country. Attributable mortality probably underestimates the true public health burden of air pollution in Ulaanbaatar (Kunzli et al. 2000, 2008). Nonmortality endpoints are linked to air pollution such as cardiovascular disease, impaired lung development, incident asthma, asthma exacerbations, bronchitis, hospitalizations, and school absences (Pope and Dockery 2006; Brook et al. 2010; Allen et al. 2009; Gauderman et al. 2004; Clark et al. 2010; Perez et al. 2009). The higher attributable mortality estimates 10.6–13.1% of total mortality. Estimates of attributable mortality are often misinterpreted as "avoidable" deaths, but it is more appropriate to interpret these as estimates of "postponable" deaths (Brunekreef et al. 2007). Air pollution represents a major threat to public health in Ulaanbaatar, and reductions in home heating emissions should be the primary focus of future air pollution control efforts. January 24 (gogo.mn) Parents to redemonstrate against air pollution, demanding officials to take immediate and efficient actions and for the well-being of children. The second demonstration will take place on Jan 28th, 2017 (Saturday) at 12 pm at the Sukhbaatar square. They demanded the government to hold their next meeting in Bayankhoshuu, the most heavily polluted area in Ulaanbaatar, where levels of PM2.5 particulates ranging between 1000-3000 micrograms per cubic meter daily. Moreover, parents demanded the government to find a way to increase accessibility to hospitals within Jan 10th, report the budget expenditure on air pollution within Jan 15th and to reduce air pollution of the city by 80 percent by 2018. However, the cabinet meeting have not held in Bayankhoshuu and many children, suffering from diseases caused by air pollution are still lying on hospital floor. Thus parents have decided to demonstrate again under the slogan "We are mad as hell". January (news.mn) The first meeting of the series of event, themed "Green Talks" was held by the Freshwater Resources and Nature Conservation Centre of the Ministry of Environment and Green Development of Mongolia. The meeting was attended by Onejin Wu, Environment, Science and Health officer of the Embassy of the United States, Carlmont high school teacher P.Darisuren, Master of Social Health Clarence Wigfall and a representative of Princeton in Asia, William Danforth. The participants gave presentation about air pollution in Ulaanbaatar. The Mongolian National University of Medical Sciences has begun research about the effect of Ulaanbaatar air pollution on pregnant women and infants with the help of Master of Social Health, Clarence Wigfall. The research is covering social health, pharmacology, psychology and technology through the year and will be publicished in 2018. The speakers said, 'It is clear that the government of Mongolia is taking action against air pollution. However, the public must protect their own health from air pollution; for example, by wearing gas-masks and using air-purifiers'. Ulaanbaatar, January 24 (MONTSAME) Pollution emitted from cars and public transportations has being measured for the first time in winter. Japanese international cooperation agency is implementing 'Capacity development project-2 for air pollution control in Ulaanbaatar' and the project team together with the Air Quality Department of the Capital City has conducted the survey in Ulaanbaatar traffic. Yesterday, measurements were made on Eco buses. Surveys of the project showed that 10 per cent of the air pollution is caused by vehicles, among which 70 per cent of it from public transportations and large sized buses. Pollution measuring instrument for moveable pollutant sources was installed on 20 vehicles, measuring in routes of straight roads, central and circled roads in morning, day and evening times. January 24 (gogo.mn) Froit Vander Harst has been living in ger district near Gandan monastery for more than 10 years. Today he talks about his experience on dry toilet and inline smoke filter that can be used and installed in normal houses and Mongol gers. "I lived in ger for 10 years. Living in ger means you live in outside and the toilet is outside. We started with wooden toilet, digging a hole. But we had a big rain in Holland which happens a lot and a toilet fills of water. It causes big disaster for us. After the first two years, we decided to find a better way to make a toilet. In Holland, we have problem with the water. In Ulaanbaatar we have problem with the cold and snow. Inspired by the Nonolet invented by 'de 12 Ambachten' in Holland, we find a way to make reasonable toilet without water. Basically by separating fluids from solids, in a perforated bag, and then dry by ventilation. Paper-cover and presser make sure the bag is used to max. Venting-system makes sure there is no smells, and dries the solids continuously. The liquids gather in a basin under the bucket, this gets mixed with our kitchen-water-waste and dumped in the local storm drain. The storm-drain is a nice green wetland in summer. We empty our liquid two times every week. Because two of us live together. We empty our solids two or three weeks usually. Solids are disposed off with the normal garbage, frozen in bag, or, in summer, bag-in-box, we have no means to re-use it. If you have lots of solids, you can give it to farmers. If you have 100 hundred families in one street, then you can start a business. It is really important to close the toilet lid when you do not use it. If you close, it doesn`t smell". After a small visit, nothing needs to be done, just close the lid. "It can work in 60 percent of Mongolian ger districts. It costs something like MNT 100,000. The most expensive thing is the pipe and that must be black. I am super happy with my toilet inside. You can also put it inside the ger". Moreover he shares his experience on inline smoke filter for small chimneys. "A filter we made to be used at the source, the home-chimney. Based on the idea that there are 4 houses to one ger in the neighbourhoods closer to the centre, but not ignoring them. The filter is a simple stainless steel mesh, in a rectangular wire frame, in a sheet-metal insert to be installed in the chimney where normally the choke-plate sits. We use two filter-units, since that mimics the chimney-top-filter that was distributed some years ago to all of Gandan, but which was too difficult to clean. We clean this filter daily, depending on the coal and the burner it may go two or three days. Cleaning is part of the routine to dump ash, get coal, chop wood and start a fire. We get 2-6 grams of soot per cleaning". January 24 (Reuters) China said on Tuesday it hopes Mongolia has learned a lesson and will keep a promise not to invite the Tibetan spiritual leader the Dalai Lama again after his visit in November led to a chill in relations. The Dalai Lama is upheld as a spiritual leader in predominantly Buddhist Mongolia, but China regards him as a dangerous separatist and warned Mongolia before the visit that it could damage ties. "The Dalai Lama's furtive visit to Mongolia brought a negative impact to China-Mongolia relations," Chinese Foreign Minister Wang Yi told Mongolia's Minister of Foreign Affairs Tsend Munkh-Orgil by telephone. "We hope that Mongolia has taken this lesson to heart," he said, according to a statement posted on the Chinese Foreign Ministry's website. China also hoped Mongolia would "scrupulously abide by its promise" not to invite the Dalai Lama again, Wang said. The Mongolian minister was not available for comment but the Chinese ministry said he expressed regret at the negative impact caused by the visit and reaffirmed his government's position that the Dalai Lama would not be invited again, first stated in December. A week after the November visit, China imposed fees on commodity imports from Mongolia, charging additional transit costs on goods passing through a border crossing into China's northern region of Inner Mongolia. "Mongolia firmly supports the one China policy, consistently holds that Tibet is an in separable part of China, that the Tibet issue is China's internal affair," the Mongolian minister was quoted as saying. Mongolia has been working to boost economic ties with its powerful southern neighbor and use Chinese investment and know- how in mining and infrastructure projects. Mongolia had previously said the Dalai Lama's trip had nothing to do with the government and he had been invited by Mongolian Buddhists. The Dalai Lama fled Tibet after an abortive uprising against Chinese rule in 1959. He is based in India. Beijing regards him as a "splittist", though he says he seeks genuine autonomy for his Himalayan homeland, which Communist Chinese troops "peacefully liberated" in 1950. Rights groups and exiles say China tramples on the religious and cultural rights of the Tibetan people, accusations denied by Beijing, which says its rule has ended serfdom and brought prosperity to a once-backward region. MINSK, 24 January (BelTA) – Belarus President Alexander Lukashenko has sent greetings to Mongolia President Tsakhiagiin Elbegdorj on the occasion of the 25th anniversary of the establishment of diplomatic relations between Belarus and Mongolia, BelTA learned from the press service of the Belarusian leader. "Twenty-five years ago Mongolia was among the first countries to recognize the sovereignty and independence of the Republic of Belarus. This brotherly support was very important for our young state," the message of greetings reads. Alexander Lukashenko remarked that the relations of Belarus and Mongolia have been always developing in the spirit of mutual understanding and respect creating favorable environment for the further enhancement of political dialogue and expansion of economic ties. "We have a big untapped potential for the development of mutually beneficial cooperation in various fields of practical interest. I am convinced that by joint efforts we will be able to utilize the exiting potential and advance the bilateral cooperation to a brand-new level," the head of state stressed. We are announcing our intermediate level 1-day course on "Project Management Process" that will be held from 10:00am to 5:00pm on Saturday, 18th February, 2017 at 10th Floor, Conference Room, Executive Excellence Business Center, Galaxy Tower. Registration deadline is 6 pm, on Monday, 13th February, 2017. The cost includes daily coffee breaks plus lunch. This group will meet every other Monday evening at 6 pm to discuss (in English) an article that was assigned and distributed the week before. "Humanities" describes a range of subjects that study human culture including archaeology, anthropology, history, literature, linguistics, religious studies, and others. Articles will be selected by the ACMS Cultural Heritage Program Coordinator. This group is open to all and will be particularly useful for individuals interested in discussing topics in the humanities in Mongolia, those intending to pursue graduate degrees abroad, or those wanting to improve their academic speaking abilities. Contact Julia Clark to get the article ahead of time. January 23 (ACMS) The American Center for Mongolian Studies (ACMS) is organizing a poster session and cultural program for Friday, March 17, 2017, 7:30-9:30pm at the Sheraton Centre Hotel (123 Queen Street West, Toronto), Provincial Ballroom South, in conjunction with the Association for Asian Studies' annual meeting and the ACMS annual meeting (which will immediately precede the poster session). Posters or displays on any aspect topic related to Mongolia, Mongolian people or historical subjects related to the Mongols are welcome. All presenters are required to appear at the meeting to discuss their work. Posters and displays may be in either English or Mongolian language, and students and scholars from all countries and fields of study are invited to participate. The audience is expected to include students, scholars, and local residents from Mongolia, and members of the community interested in Mongolia. To propose a poster or display for the session, please send a brief abstract or description (no more than 250 words) to David Dettmann at ddettmann@mongoliacenter.org before March 1, 2017. Posters and displays will be accepted on a rolling basis. You do not need to be registered for the AAS conference to participate, but poster presenters should be a member of the ACMS at the time of the meetings. January 24 (MONTSAME) An Inner Mongolian scholar is awarded a highest prize of the Mongolian Academy of Sciences. The "Khubilai Khaan" golden medal is presented to Professor B.Gerelt in recognition of his contribution to the development of medical sector of Mongolia. The medal was handed over to him by the President of the Mongolian Academy of Sciences, academician D.Regdel on January 17. Prof. Gerelt established a Mongolian Medicinal Plants Laboratory in 1999, which is fully provided with modern high-precision equipment from Japan, Germany and USA. At the end of 1999, the laboratory was expanded as a Chemical Institute of Traditional Mongolian Medicine at the Inner Mongolia University. Since 2000, Mr Gerelt has been performing research and studies in cooperation with the Technology and Production Corporation. Furthermore, his academic research work on AIDS attracts attention of scientists and researchers among his large number of academic works, including technical standards and guidelines of more than 10 new drugs he made for approval and introduction in practice. Ulaanbaatar, January 24, 2017 (UN Mongolia) Harsh winter conditions are severely impacting herders and their livestock in the Northern part of Mongolia. In response to the deteriorating situation, the United Nations has allocated $1.1 million through its Central Emergency Response Fund (CERF) to launch a rapid humanitarian response and provide life-saving assistance. Across the country, 157,000 people (37,000 herder households) in 17 out of 21 provinces in Mongolia are affected with 8,000 households in urgent need of support. The early onset of winter in late October 2016 and high levels of snowfall in large parts of the Northern belt that exceeds those of the last dzud winter have put the precarious livelihoods faced by many herders under further strain. Incomes have continued to be hurt by falling meat prices since late 2015. Averse weather patterns over the summer and autumn in 2016 with drought conditions in the North-East affected pasture growth and late autumn rains destroyed part of the harvest. This jeopardized the preparation of sufficient forage reserves that are needed to get the livestock, on which herder livelihoods depend, through the extended and cold winter. Complementing the efforts of the government, UN-CERF funds aim to address the most urgent needs of 3,500 poorest and most vulnerable herder households across 36 soums in 13 aimags. To assist herder families to access essential items such as food, fuel and basic medications, CERF will provide multipurpose cash grants. The most vulnerable families will also receive animal feed packages and veterinary first aid kits to minimize the loss of livestock as their main source of food and income. "The current severe weather is threatening the survival and dignity of thousands of herder families. This life-saving and time critical assistance, will help shield the poorest and most vulnerable from the potentially devastating effects" said Beate Trankmann, UN Resident Coordinator in Mongolia. Brigadier General T. Badral, Chief of National Emergency Management Agency (NEMA) thanked the United Nations for its assistance in overcoming the harsh winter situation in Mongolia saying "I hope that this humanitarian assistance will reach the herder households most in need and believe that it will improve their livelihoods." The CERF funded interventions, which will be carried out by UNDP and FAO, are due to begin in February 2017. These will supplement ongoing health, nutrition and protection activities carried out by UN agencies including WHO, UNICEF and UNFPA and will be closely coordinated with interventions of the government and other humanitarian partners. An estimated total of $6.7million is required to meet the humanitarian needs created by the current extreme weather, of which the CERF grant will cover some 16 per cent as an initial response. The Humanitarian Country Team will continue to advocate for additional resources to ensure that life-saving needs of the most vulnerable households in all parts of Mongolia are met. IFRC allocated CHF 158,459 from DREF on 15 January 2016 to support MRCS in provision of food and unconditional cash grants for 1,500 households affected by dzud, and the mobilization and deployment of 13 NDRT members and one RDRT member. The emergency appeal was launched on 29 February 2016 for CHF 833,415 to assist 25,500 people (5,100 households) affected by dzud disaster, for a period of 12 months, with a focus on detailed assessment, food security, nutrition and livelihoods, community preparedness and risk reduction. See emergency appeal. An operation update (no. 1) was issued on 31 March 2016 to provide overview of the progress made since the allocation of CHF 158,459 from IFRC's Disaster Relief Emergency Fund (DREF) on 14 January 2016 (covering the period until 15 March) – which was followed by the launch of the emergency appeal operation. The main focus of MRCS during this period has been on assessments, procurement of food items and distribution of food to households in need. A total of 1,500 vulnerable herder households (7,500 people) were assisted. An operations update (no. 2) was issued on 13 June 2016 to provide a progress update of the operation since the previous update (16 March to 30 April 2016). During the reporting period a total of 1,767 households (8,835 people) were assisted. A revised emergency appeal was issued on 20 July 2016, with an increase in number of people to be reached (from 25,500 to 35,000 people ), an increase in activities, slight increase in budget (from CHF 833,945 to CHF 979,346); and refocused geographic scope (from 20 to 17 provinces). Six-months summary update (no. 3) issued on 27 August 2016 to provide consolidated information on the first six months of the operation. This is the fourth operation update to report on the progress of implementation up to end of December 2016 and largely reflects that all planned outputs under this operation are completed except for some monitoring activities and the final evaluation. January 23 (Birding Mongolia) On 30 June 2016 Otgonsuren Avirmed and I were measuring Elm Ulmus pumilo trees at the Undai River in Khanbogd soum, Umnugobi province (42.6734ºN 106.9606ºE). This was part of an ongoing survey by the Wildlife Conservation Society of Mongolia. When I looked up I saw a strange bird which was mainly white, grey and black. It was feeding slowly within the canopy of the trees and I quickly took two photographs. I could not identify it at the spot so pictures were sent to Gankhuyag Purev-Ochir, Purevsuren Tsolmonjav, Amarkhuu Gungaa and Batmunkh Davaasuren for checking. It turned out that we had found Mongolia's first Ashy Minivet (Pericrocotus divaricatus)! We could not check the site the next day so it remains a one-day wonder. Ashy Minivet has been on our "next for the country list" for long. It breeds from Amurland in Russia's Far East and NE China south to Korea and also in Japan. Its non-breeding range lies mainly in SE Asia, on the Greater Sundas and in the Philippines, and it occurs also regularly India. Given this range the species has been expected to visit Mongolia on migration for some time! Congrats guys! Ulaanbaatar, January 24 (MONTSAME) The 2016 Ice Climbing Championships of Mongolia took place on January 21 and 22 at the International "Nairamdal" Children's Camp. The championships were participated by some 80 climbers. The national championships of ice-climbing was initiated by State Honored Athlete and mountaineer G.Usukhbayar and first organized in 2011 with 12 participants at the frozen Orkhon waterfall in Uvurkhangai province. The Mongolian National Mountaineering Federation (MNMF) has erected a 15-meter tall artificial wall. A medalist from the 2009 World Ice Climbing Championships and International Master of Sport Nadejda Launitz and a bronze medalist from the Ice Climbing World Cup and champion of Russian mountaineering Vasilii Terehin worked as advisors. The MNMF has been attaching greater attention to its international collaboration in the past couple of years. The federation has organized a joint training with the professional climbers from China and is planning to train participants to partake in the Tokyo 2020 Olympics. Three winners were granted medals in each category and "Erdenetuuliin Kholboo" (Union on Erdenetuul) team won the championships with the highest overall score, followed by "Eruul Mongol Kholboo" (Healthy Mongol Union) and UB Hiking Club. January 24 (Judo Inside) Mongolian middle weight Munkhzaya Tsedevsuren and lightweight Bundmaa Munkhbaatar both day goodbye to her judo career. The 30-year old number five of the London Olympic Games and World Bronze medallist in 2015 U63kg will not continue her quest for Tokyo 2020, same for 31-year old Munkhbaatar. Tsedevsuren's career started in the category U70kg where she was a promising junior in Asia in 2005, but since she switched category to U63kg she won her first Asian senior medal in 2009 when she was 22 years. Since then she won five World Cups, three in Ulaanbaatar and in Cairo and Sao Paulo. In 2015, her best year she won the Asian title in May, gold at the Grand Slam in Tyumen in July, followed by World bronze later that year in Astana. At the London Games she lost her bronze battle against Yohie Ueno, but in Astana she defeated one of her most frequent and favourite opponents, Yarden Gerbi, in the bronze medal bout. Tsedevsuren competed at six World Championships since 2005 and two Olympic Games. In 2016 She won her first contest, but lost to Yang Junxia and finished ninth. After the Olympic Games she captured a bronze medal at the Grand Prix in Qingdao but now announced her retirement, not even a week after Sainjargal Nyam-Ochir retired and on the same day as Munkhbaatar Bundmaa announced her retirement as well. Munkhbaatar who was bronze medalist at the 2010 World Championship in Tokyo represented Mongolia at U52kg for 10 years. Munkhbaatar won a bronze medal at the World Championships in 2010 U52kg. She won the Universiade in Bangkok (Student World Championships) in 2007. Munkhbaatar claimed the gold at the Grand Slam in Paris in 2011 U52kg. In 2016 she won bronze at the Polish Open in Warsaw and won bronze at the Grand Slam in Baku. The 31-year old is still ranked 17th in the World. She won 20 World Cup medals and booked victories since 2009 in Ulaanbaatar, four victories in 2011 of which Paris was her highlight, but also the Grand Slam in Moscow, Ulaanbaatar and GP Qingdao were memorable wins. In 2013 she booked the victory at the Grand Prix in Jeju. She fought at 8 World Championships including her bronze medal in 2010 and fought three matches at two Olympic Games in 2008 and 2012. Tsolmon Adiyasambuu (24) is her logical replacement. Mongolian is building a new team with Dorjsuren and Munkhbat as World Ranking leaders, and still 8 judoka in the top 10 and 14 in the top 20. Most of them though are between 26 and 30. The youngest judoka in the top 30 are Tsogtbaatar Tsend-Ochir U60kg (28 and 20yrs) and Mungunchimeg Baldorj (30 and 22yrs), also fighting U63kg. However Tserennadmid Tsend-Ayush is the most likely number one in this category ranked 13th in the World. January 24 (news.mn) Mongolian top model Nora Dagva has received an invitation to be a guest judge at Britain's 'Next Top Model; show. However, she has not yet signed any agreement. Martin Redman, consultant producer of Mongolia's 'Next Top Model' show, gave her the invitation. Nora Dagva is currently hosting Mongolia's 'Next Top Model' show, which can be seen on Education TV. The programmes started on 15th of January. The show is the Mongolian version of 'America's Next Top Model', the most successful and longest-running fashion reality TV series in history. Tyra Banks' Next Top Model is currently being shown on TV in 170 countries and regions around the world. Britain's 'Next Top Model' show will be on television from April. Ulaanbaatar, January 24 (MONTSAME) E.Amartuvshin, State Honored Artist of Mongolia and soloist of the Theatre of Mongolian State Academic Theatre of Opera and Ballet has performed his first concert at the Teatro San Carlo in Naples, Italy in accordance with his agreement with the theatre. He will play the role of Rigoletto in the "Rigoletto" opera composed by Giuseppe Verdi four times in total, including on January 25, 29 and February 1. He is also planning to attend an opera for children on January 25, 26, 31 and February 1. Rigoletto opera is being conducted by Italian famous music conductor 85-year-old Nello Santi. On his own Facebook page, soloist E.Amartuvshin shared his feeling that "The concert was another wonderful evening of my life. It was amazing, but challenging to sing at the Teatro San Carlo in Naples. I feel honored to sing with the greatest conductor Nello Santi". Then, he thanked for his fellow singers at the opera. Ulaanbaatar, January 24 (MONTSAME) The National Academic Theatre of Opera and Ballet of Mongolia performed "Chinggis Khaan" opera written by B.Sharav, State Prize Winner and State Merit Figure of Mongolia, on January 21-22 in Ulaanbaatar. For two days of the "Chinggis Khaan - a unique opera of the world, the seats of the concert hall were full of foreigners and Mongolians alike. This opera, one of the biggest cultural and spiritual heritages of Mongolia, shows the Mongolian traditional heritage and lifestyle. Initially produced by L.Erdenebulgan, State Merit Figure in 2003, the Chinngis Khaan opera was re-produced by Ch.Naidandorj, stage director of the State Academic Theatre of Drama this time. January 24 (news.mn) Mongolia is expecting to attract four million visitors by 2020. In this connection, Ulaanbaatar City Tourism Department has signed a cooperation agreement with Ulaanbaatar Police Department for ensuring tourist safety. First of all, they will focus on the language skills and communication abilities of the capital's police officers. Furthermore, mounted police and car patrols will operate at tourist destinations. The 'Student Police' programme will continue. Ulaanbaatar, January 24 (MONTSAME) Mongolian Visitor Information Center was opened in Surabaya city of Indonesia on the occasion of 60th anniversary of the establishment of diplomatic relations between Mongolia and Indonesia. The launching event took place on January 23 at the Honorary Consulate of Mongolia in Surabaya with a view to strengthen diplomatic ties and also people-to-people relations between Mongolia and Indonesia. During the ceremony, Ambassador of Mongolia Sh.Battsetseg expressed her belief that the Mongolian Information Center in Surabaya will give a wider understanding of the Mongolian culture and traditions and become part a common platform for Mongolia and Indonesia in the promotion of social economic and culture exchanges, enhance understanding and friendship between two nations. "The visitor Center is open to support and provide an one-stop information service to Mongolian social-economic areas on a wider range of study aspects including information enquiries, tours, government scholarship programs, business entertainment, dining, sports, adventure, shopping and travel tips. The center creates easy access and awareness of Mongolian related facilities within the area" according to the Facebook page of the Embassy of Mongolia Jakarta. The Embassy of Mongolia in Jakarta is planning to open Tourism Information center of Mongolia in Jakarta in May 2017.